Lightweight aluminium sectional ladder with spigot connections. Available in 1 to 6 sections. Safe, light ladder which easily fits in the boot of a car. Surveying buildings means working at all heights to inspect a property, having a convenient ladder that is easy to transport and set up would be ideal. Our sectional 'surveyors' ladders are a great way to allow the user to inspect even high up areas. They are lightweight making them ideal for carrying to and from different locations. Constructed from aluminium they are durable and come as sectional ladders with spigot connections. They are available in 1 to 6 sections and a variety of extended heights; 920mm, 1800mm, 2700mm, 3600mm, 4500mm or 5400mm. Serrated rungs offer excellent underfoot grip to the user and these safe, light ladders easily fit in the boot of a car for convenient transportation. 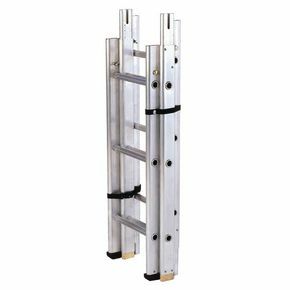 Our sectional 'surveyors' ladders allow the user to inspect hard to reach areas easily, offering the ideal ladder for easy transportation and use in different locations. These ladders come with FREE UK Delivery.